Scrum is a lightweight, team-based framework based on Agile values and principles. The goal of Scrum is to break down complex projects into small amounts, continuously delivering value on a more frequent basis to customers while promoting higher productivity, employee engagement, and end user satisfaction. 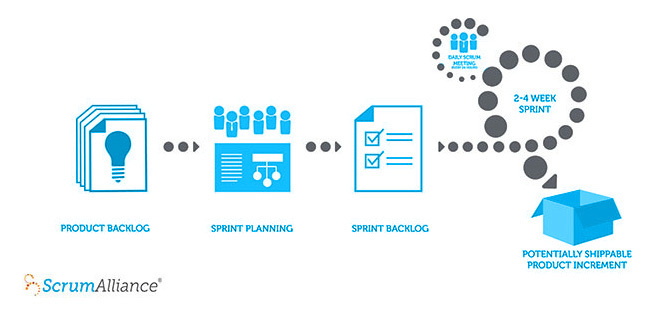 Since the early 1990s, Scrum has been used to manage work on complex products. Taken from an analogy to the sport of rugby made by authors Hirotaka Takeuchi and Ikujiro Nonaka in a 1986 Harvard Business Review article, Scrum has become a primary entry point to introduce people and organizations to true agility—in other words, being Agile instead of doing Agile. In other words, consider Agile a mindset and way of being; your teams and staff integrate Scrum into their daily work life until it becomes habitual. Over time, you can see your organization build and self-maintain the practices and ceremonies that generate productivity, engagement, and create amazing software, books, cars—anything at all---for your end user.